Our day started at 5:45am EDT. Both of us were excited at the prospect of seeing my sister Naomi. Little guy usually doesn't get up quite that early but he was awake and happy and seemingly ready to go. Thanks to my mom, our bags were packed the night before, leaving only a few last minute additions necessary for the morning. Deodorant, hairbrush, iPad, chargers, and the cooler bag (I forgot to add the freezer packs of course). As far as leaving-for-vacation-frenzies go this one was pretty mild. It was also helpful that I also had the cry over traveling without Joe with her and hadn't put it off until the big day. Little guy and I drove to meet my friend Richard who was helping out with our transport to JFK. We stopped off at Starbucks on the way to meet Richard and filled up the car with gas. Even though I fly all the time, I was nervous. It wasn't even my first flight with my son, but it was the first one where he had his own seat and where no one would be meeting us at the airport. I would be dealing with all of our travel bags, a car seat, and an attachment to the car seat that makes it a stroller. As we were driving, I admitted to Richard that THIS flight was stressing me out. I had measured the car seat the night before and compared it with what seatguru.com had to say about the seats on the flight we were taking. The car seat was more than 2 inches bigger than the width listed for the seat. I had read some online blogs from people who said they had no problem with the same car seat so I figured I would at least try. I was still on edge about it right up until the moment I eased the car seat into place and buckled it in. The summary of my air travel? I love Flight Attendants. From my friend Richard who helped me out when I was feeling apprehensive about going through security and getting to the gate to the FA at the door to my flight who assured me the car seat would fit and that I could wheel it right up the aisle with Domani in it, I am grateful for their assistance and care. 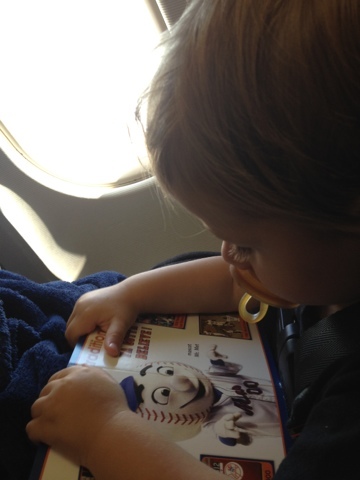 Domani got comfortable in the car seat quickly, reading his Mets book as we prepared for takeoff. At one point he even broke out into a spontaneous "Yay Mets" cheer with his fist in the air. He loved watching out the window during taxi and takeoff. By the time we hit 10,000 feet he was asleep and he stayed that way for about two hours. I'm not sure if this is true for all car seats, but for his (Evenflo Triumph 65) it put his feet dangerously close to the seat in front of him and prevented me from putting my tray down. And by dangerously close I mean dangerous for the poor woman sitting in front of him. He didn't kick the seat, but he did push on it quite a few times. I, of course, let him know that he needed to be gentle and not push on the seat. He would stop for awhile, but then "stretch out again" at some point (who among us has not had THAT urge on an airplane!) As for my tray issue it ended up not being a such a big deal because Domani was asleep when the drinks were served. I was able to have a coffee and some yummy cookies to dip in it without needing the tray. Granted, I finished both a lot faster than I normally would have, but overall not a bad trade off for getting to go visit my sister with my little guy. Once the little guy woke up he required constant attention so the next two hours consisted of feeding him lunch, giving him books, talking about the different parts of the plane, telling him to stop pushing his feet into the seat in front of him, giving him a variety of snacks and his water cup, monitoring his iPad use, and finding books for him to read. He got excited again when the plane started its descent. When we finally landed we waited patiently to gather ourselves together and I was thankful once again for the FA who helped me push his carseat off the plane when Domani absolutely refused to get back in. (I couldn't really blame him after being in the carseat for just over 5 hours straight.) After a quick bathroom stop (the stalls were nice and large and there was a special room for changing babies), it was off to collect our bag and get the rental car. Thankfully, I was able to coax him back into the carseat for easier transport to baggage claim. As we were walking through the airport several people noticed our GoGo Kidz Travelmate attachment for his carseat. One wife leaned over to her husband and said "Look at THAT! What a great idea!" And a great idea it really was - I wouldn't have made it through the single mom at the airport excursion without it. By the time we arrived in baggage claim, our bag was the only one left on the stopped carousel. This was the moment of truth. Would I be able to manage the kid in the "stroller", the carry on bags, and the big checked bag AND make it to the rental car counter? I was relieved when I was able to handle it all and overjoyed to realize that the rental car counter was just a short walk across the way from baggage claim. The line was short and our car was ready for us. I'm pretty sure Hertz overcharged us (still have to check my original quoted price), but at least we were able to get moving quickly. It was dark in the garage where the car was parked which made it difficult to install his carseat (especially with him walking around the back seat of the car), but the Sirius radio was working and I only required a quick peek at the Owner's Manual to determine how to release the emergency brake. My GPS was working by the time we hit the airport exit and Greg Dulli was hosting for an hour on Sirius XMU. Just perfect. We made good time to Pocatello, Idaho. Domani dozed off for most of the ride. We arrived a little after 5pm, a full 13 hours after we started our journey from New Jersey. It was all worth it though when we got to give Naomi a big hug and get the "grand tour" of her place. She cooked us some food on the grill and much later that night cuddled her nephew until he was ready to go to sleep. It was so worth it.